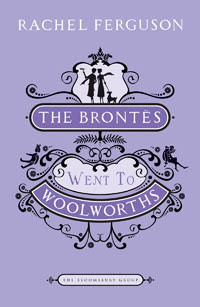 Wicked Wonderful Words: Review: "The Brontës Went to Woolworths"
If you like a bit of whimsy and if you find yourself drawn to Anne Shirley from "Anne of Green Gables" (by L.M. Montgomery) because of her tendency to escape into her own fantasy world, then you will love this book. Being completely honest - which I find to work best for me on this blog - I was drawn to "The Brontës Went to Woolworths" by Rachel Ferguson not because I liked the sound of the plot but because I loved the title. Simple as that. And the title is actually very describing. Meet the Carnes. A family consisting of three girls and their mother as well as a sour governess and several made up chacters. Living in pre-war London, these women have made good lives for themselves. Deirdre, the main charater, is a journalist with a good head on her and her sister Katrine is an aspiring actress. Both of them are clever girls, well able to to take of themselves and to take on the sour, constantly offended governess who tries to protect little sister Sheil from the rest of the family. Now why is the governess so protective and so worried that Sheil will be damaged by her vivacious older sisters? The question lies in the irrepressible imaginations of these two girls. Not content with the normal everyday lives of middle class girls, they have dreamt up a world of their own which their mother is quite happy to participate in. In this world, they regularly get visits from Ironface, an old doll of Deirdre who married above her station and is now living a socialite's life in France from which she descends upon them with her la-di-da manners. They are also close friends with Dion Saffyn, a pierrot, whom the close family friend Judge Toddington does not think is good company. Toddy, as they affectionately call him, is the man of the house. Calling them every evening, bringing them splendid presents and being ever so dear to them. Only they've never met him in real life... And one day reality strikes when Deirdre meets Lady Toddington - or Lady Mildred - as they call her, at a society event and is drawn into a friendship with her. The clash between the real and the imagined is very relevant today I find. When I was a teenager, it was all Brad Pitt and Tom Cruise (who are now middle-aged, gee I feel old! ), today I guess it is Justin Bieber, there isn't a teenage girl who hasn't had a crush on a guy she didn't know, whether celebrity or just a boy on the bus. This book is like 1930's YA. It is a great alternative to unimaginative boy-meets-girl stories and the perfect present for the girl who loved "Anne of Green Gables". This is quality people!! For the Carne girls, especially Deirdre, Toddy is that secret crush-from-afar, the Justin Bieber. She adores him, and her worry and fear when he suddenly becomes part of real everyday life, I can completely understand. Oh how I felt for her. Sometimes, isn't it better to have a good daydream than a harsh reality? Anyway, I will not say anything more because I don't want to throw spoilers at you but let me just say that Rachel Ferguson turns this story on its head and invites the reader to ponder what is most strange - eccentric girls with their own fantasy worlds or realists who are unable to partake in daydreams? And where do the Brontës fit in? Well apparently Katrine and Deirdre saw them go into Woolworths to fetch some highly everday-boring items, including a hairnet. Read it if: You are a daydreamer. If you love Anne of Green Gables. If you too believe that the losers are not the people who allow themselves to let their imaginations soar and dream big and grand but the people who are unable to follow them into the realms of imagine. For a moment I though the book was just yet another Bronte spin-off. Glad to know there's more to it :) And I do like girls living in a fantasy world like Anne or Jo, so this one might be exactly my cup of tea. The title is so great, it has attracted me to this book as well. I lived in my own imaginary world as a teenager and to some extent still do, I think I would love this book! Sam, I think you would. It is really wonderful and whimsical.Just like the title. I loved Anne of Green Gables! I ate those books up (and the movies)! I must get my hands on this one next. Bookmarked.